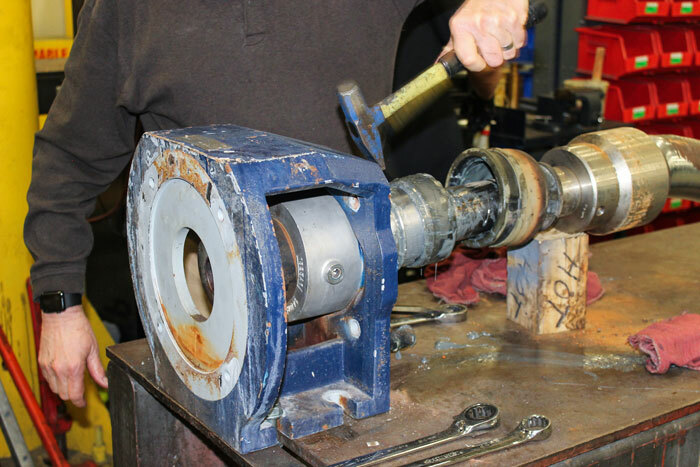 Technicians recently received and disassembled a progressing cavity (PC) sludge pump that fed centrifuges in a wastewater treatment plant for eight years without repair. The pump was still durable, but it was time for an upgrade. The Oakwood Beach Wastewater Treatment Plant on Staten Island, New York, is one of 14 wastewater treatment plants managed by the New York City Department of Environmental Protection. The plant was built in 1956 and has the capacity to treat 40 million gallons per day (mgd) of wastewater. The city has been using several PC pumps feeding sludge at 300 gallons per minute (gpm) at 35 pounds per square inch (psi) to a centrifuge for dewatering. The city had the budget to replace the pumps and moved forward with the upgrade. Eight years later, the original pumps that had operated reliably for 26,000 documented hours without even a rotor change were removed. The pumps were sent to the service center at their facility in the Midwest for full inspection and assessment. The pump arrived at the facility early on a Monday morning. The pressure branch was removed, and then the stator. The rotor was noticeably worn. The rotor was measured with a caliper to determine residual stator and rotor interference. It measured 2.67 millimeters (mm), which is considered acceptable and normal wear. The high demands for performance, efficiency and resistance to erosion placed on rotors require surfaces of the highest quality. State-of-the-art machining, cutting and coating processes created the optimum surfaces. The rotor on the tested pump was made of air-hardened grade D6 tool steel with ductile coating. Only the ideal interface between the rotor and the stator guaranteed high efficiency and long life. An even compression between the two main pump elements was crucial as well. The stator also exhibited visible and expected wear, especially when compared to a new stator. Next, the plug-in shaft was removed. Because of the mechanical seal, there was no wear on the plug-in shaft and it could be reused. The seal and seal casing, made of 316 stainless steel, could also be reused. The plug-in connection between the shaft seal and the drive casing makes maintenance work easier. This universal joint, which was filled with special grease, was hermetically sealed with a flexible universal joint sleeve and two holding bands. The joint held a significant amount of grease upon disassembly. The grease was not discolored and it contained no water. The rubber joint sleeve was aged, but still operational. This was a good sign that internals were properly lubricated throughout the lifetime of the pump. The good lubrication contributed to its longevity. This joint was constructed from just a few wear resistant, hardened and exchangeable components. It is fastened by means of a retaining sleeve on the rotor head, the plug-in shaft head or the drive shaft head. Tight manufacturing tolerances ensured that the pump ran quietly and smoothly. Careful sealing of the pin joint and proper lubrication increased life dramatically. The plug-in shaft pin was extracted, and it also exhibited normal wear. The pin changed color and showed polishing, but no real wear. Image 2. Pin joint life increases after sealing the pin joint and lubricating it properly. 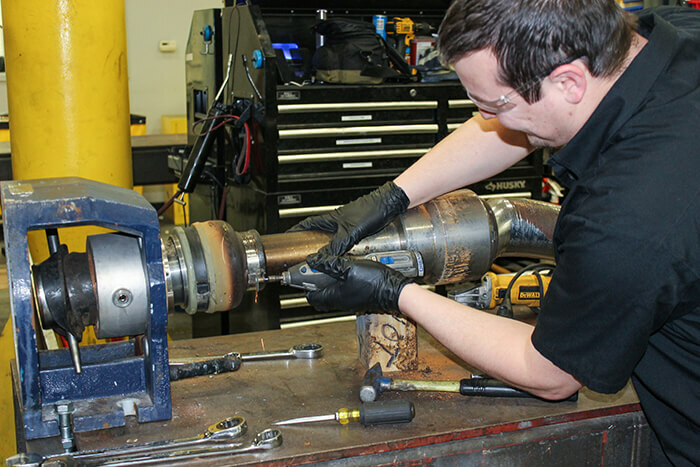 At this point in the inspection, the sparks really started to fly when the coupling rod and universal joint sleeve were removed to reveal even more like-new grease on the rotor joint—another good sign that the components could still run smoothly. The bushings in the rotor head, plug-in-shaft head and the coupling rod were just like the pins—like new. The only indication of use was slight erosion. The joint cover was in good shape, as was the rotating seal face, which needed a new seal. Both would still be operational. An automobile averaging 60 miles per hour for 26,000 hours without stops would have 1.5 million miles on the odometer. A dishwasher used an hour per day would run for 71 years. A garbage disposal used 15 minutes a day would last 284 years. Normal wear was exhibited on all major components of the pump. The rotor, stator and seal would have needed replacement, while the coupling rod and plug-in shaft could have been cleaned and reused. Had the city not been replacing this pump, it could have undergone parts replacement and potentially operated even longer. Kathryn DeWell is the marketing assistant at SEEPEX Inc. She may be reached at sales.us@seepex.com. For more information, visit www.seepex.com.